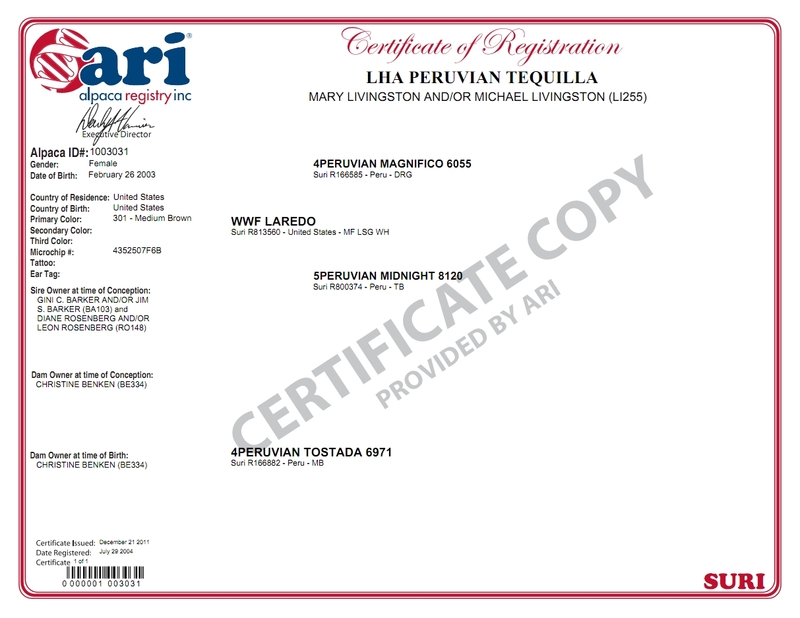 Laredo is the son of 4P Magnifico (rose grey) and 5P Midnight (true black). He is medium fawn, light silver grey and white colored. Proven dam that has crias of dark colors and great potential. This dam is an excellent mother has lots of crias in her future! 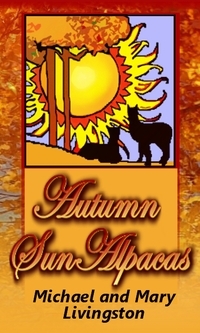 If she is bought with two or more suri alpacas her price will be $500, not including any breedings that can be purchased separately. If bought alone, her price is $1000. Tequilla is a beautiful, stretchy, majestic girl with glorious red hair. She displays her name proudly with her salty white hairs around her mouth. She has wonderful coverage, including on her legs along with good bone structure. Her regrowth is already begining to pencil up once again. Her parents, WWF Laredo and Tostado are of full Peruvian descent. She has a half brother and a half sisiter who have earned multiple championships in the ring. Tequilla has shown well herself in very competitive clases with her luster, density, conformation and lock structure. 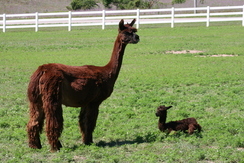 Her progeny was a large part of her decision, with five previous dark and award winning crias. Tequilla delivered a brilliant white female with black toenails. A good sized girl at 17 lbs. 5 oz. 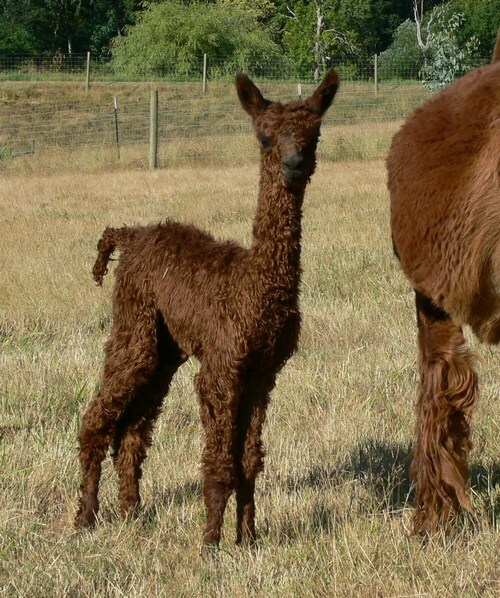 she had beautiful fleece... Meseta's 2007 fleece micron was 17! A > 21lb amazing medium brown female with the lock, luster, density and coverage expected from pairing of Saber and Tequilla. This full Peruvian girl became a multiple Champion in the ring! This dark brown male showed the range of color that Tequilla could produce with his black nose and feet. He had great independence in his solid, lustrous locks! Full sister to multiple brown Color Champion winning female, Talwar. This strong male was named Jagermeister. 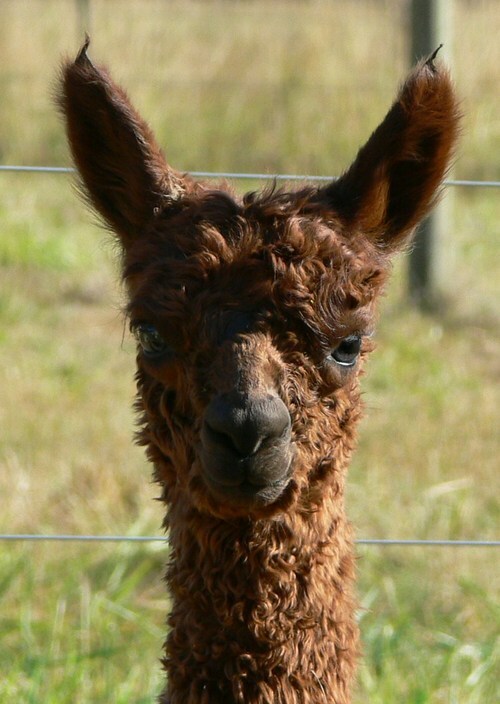 He was sold as cria! We were thrilled with the dark, dark color of this female as well her coverage on her face and toes. She has lustrous dark fiber like a chocolate dessert or rich silk fabric! 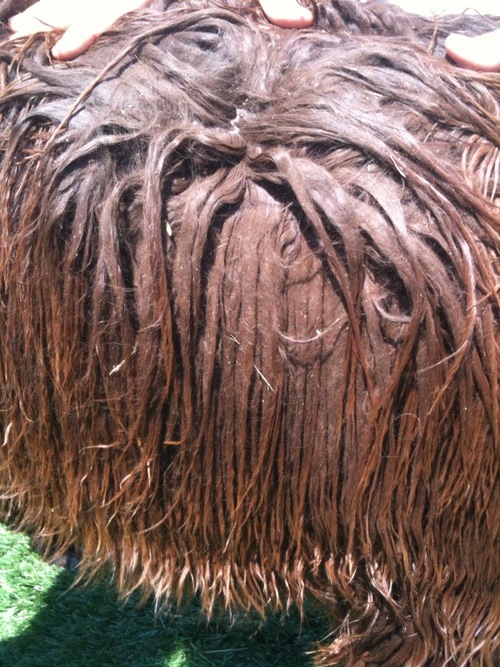 This boy was fantastically covered in locking fiber at birth; this boy was a 'real looker'. We sadly lost him unexpectedly as a weanling. We often wonder about these sudden occurrences but know that mother nature often has its reasons. Tequilla had a beautifu black male by Kobe with coverage and locking. She is a color producer! 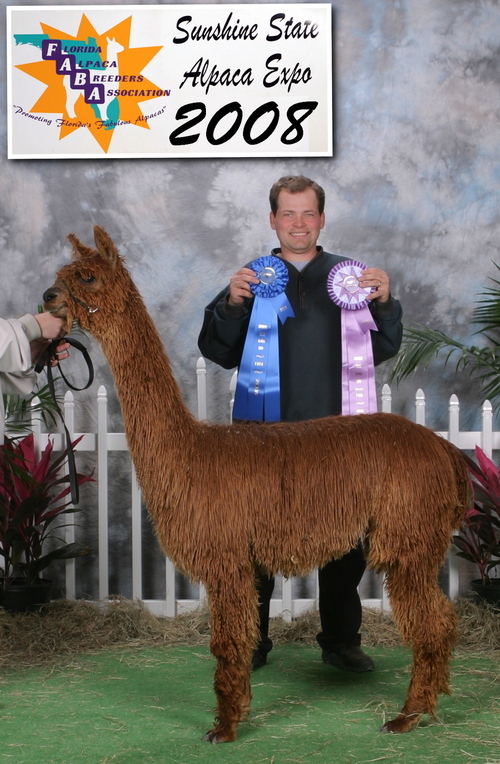 1st Place - 2003 - AOBA - Shorn Class. Comments from Nard Mullen: "Very solid female with good bone and lots of substance. A very nice size female with great conformation and soft fleece."